Welcome to Studio Saturday! Each week one of our contributors gives you a sneak peek into their studio, creative process or inspirations. We ask a related question of our readers and hope you'll leave comments! As an incentive we offer a free prize each week to bribe you to use that keyboard. The following week we choose a random winner. This week's winner is Pam of Klassy Joolz! Congratulations, Pam! You have won your choice of a mushroom pendant or a pair of yellow tulip charms from Erin Prais-Hintz of Tesori Trovati Jewelry! Send Erin PH an email with your address and she will get your prize out to you soon! Here is my current studio space! I realized I've never ever shared my actual jewelry studio here on Studio Saturday! Mainly, that's because it is usually in such a disastrous state that I wouldn't wish to show anyone on a good day. Recently, I received a much needed reprieve when the grandparents took my 2 1/2 year old daughter, Nora off my hands for a weekend. What did I do with my rare freedom from motherly duties? I cleaned out my whole studio from top to bottom. Obviously, you can clearly see where my priorities lie. As soon as I get a moment to myself, I go straight to fixing up my studio! Oh, and deciding to take on that task was not that fun, mind you. There were huge boxes upon boxes of stuff piled up under the desk, items and paperwork that I had been avoiding dealing with for over a year and a mish-mash of beads and findings in every corner that had been thrown every which way. In my defense, I did have some help with the beads going everywhere part. There's a 2 1/2 year old cutie pie around here that loves to play with Mama's beads. ;) Even with all that work, there is plenty more I would love to do with my space, but at least it is clean, the top of the desk is clear and I can work in there once again. It was all well worth the effort. So, let me take you on a mini tour! In the top picture above, you see my main work surface where I create my pieces. Here is where I keep some of my finished jewelry and favorite displays, a few bead storage units, my essential jewelry-making tools and some bead bowls and baskets. I love the colorful art piece on my wall. It makes me happy to look at it. I would love to hang more art on the walls soon! This wall is directly behind the desk and chair. The pegboard expands across almost the entire length of the wall. Over the years of making jewelry, I've learned I work most efficiently when I have my supplies out where I can see them all the time and can get to them quickly and easily. 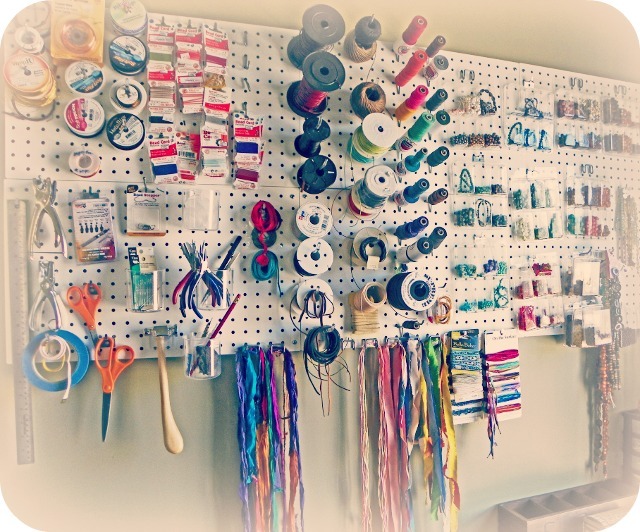 My pegboard wall holds materials and tools I use on a regular basis: metal gauge wire and beading wires, rulers and measuring tapes, scissors, hammer, metal and leather punches, bead stops and misc. tools, silk knotting cords, leather cords, suede lace, hemp, cotton and Irish waxed linen cord, silk cords, dupioni ribbon, sari ribbon and fibers, glass beads, gemstones and wood beads. I've had a few people ask me where I have acquired some of the items I have in my studio space. In case you are wondering, too, I have provided the following handy list of resources! I hope you enjoy the links and information. If you'd like to know about something that is not on this list, just ask me in the comments! 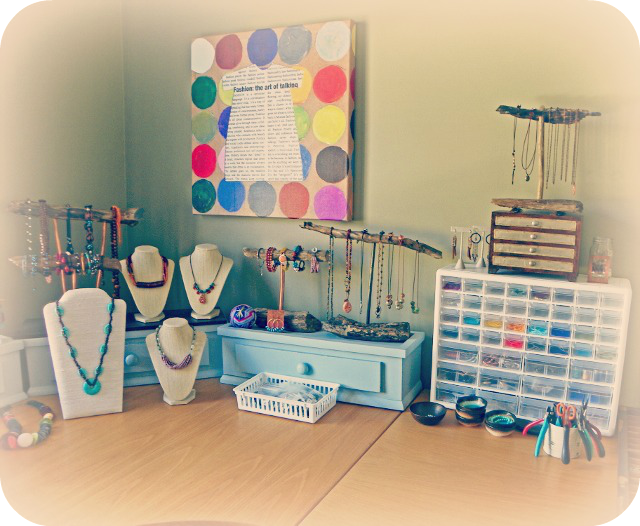 Studios and organization is such an interesting topic for jewelry makers because anyone who works with beads knows the dilemma of bead storage and setting up a creative space that works. It is the bane of our existence! Isn't it? There seems to be no easy answer or solution for most of us. Ideally, I'd love to have absolutely every bead and finding visible at a glance. Just like when you walk into a bead shop, everything is out where you can see it! How do you like to organize your work space? Do you have any tips or tricks you are willing to share? Know of any resources for great bead storage ideas? Help us get organized! Please share in the comments! I'd love to hear your thoughts on studios and organization. 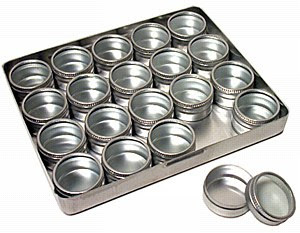 Leave a comment answering any of the above questions and you will be entered for a chance to win this 20-piece, aluminum storage container from Ornamentea.com to organize your beads or findings! Thanks for joining me today. Happy creating and organizing! Erin Siegel is a jewelry designer, beading instructor and co-author of the jewelry book, Bohemian-Inspired Jewelry: 50 Designs Using Leather, Ribbon and Cords. To find out more, visit her blog: Erin Siegel Jewelry. I'm probably like you and everyone else in that I'd like to have as many of my supplies out and visible as possible. I LOVE your pegboard and will probably implement that idea soon. In addition to making many items easy to find and neatly stored, it will free up the drawer space they are taking up now for other things not as easily hangable. Thanks for sharing. I organize by category (gemstone, glass, natural etc.) and then by color withing each. Makes it a lot easier to select beads for a design when they are organized by color. Ikea, if you are lucky enough to have one nearby, is a great place to pick up glass containers (used for large votive candles), trays and slim drawer cabinets. I have those white opaque containers with sections inside that I keep all my metal blanks, findings, charms, beads and everything in. I love those. I have each one labeled and they're stacked on a small three shelf book case. All right beside my work desk. Love that pegboard, Erin! Like you and most of us out here I like to have everything where I can see it.....helps to inspire me. My studio is inside a double closet which was a great idea for a while but I've outgrown it onto my dining room table so I'm going to have to come up with something new(like a bigger home).Thanks for sharing.Nan of Studio In The Wall. Hi Erin, I really love your pegboard for many reasons: easy to find what you are looking for (so much harder when it is thrown in a drawer) and you know right away when something is running low. My favorite resource is a large (60 drawer) storage unit, which I use for everything from sewing notions, polymer clay, small beads and findings. I buy mine at hardware stores... here in Canada at the Canadian Tire chain, where they frequently go on sale at 50-60% off. I think Harbor Freight have the same type of units in the U.S.
My work area is a series of narrow (20" x 72") banquet tables, set against the wall. I put my multi-drawer storage units at the back and still have tons of room in front for multiple projects. Wheeled larger storage units fit under the banquet table. I would say my biggest tip is: look in unusual places for studio furnishings. I bought the sturdy, washable banquet tables at a Staples clearance sale for about 5 or 6 bucks apiece. I have several rolling office chairs throughout my studio (yep, Staples clearance, 5-15 bucks apiece). The more you save on storage, the more you have left to spend on gorgeous beads. Yay! Your studio is so dang CLEAN! Mine is incredibly horrible. I mean, really shameful. Its gotten to the point where I don't even TRY to clean it up--it is just a war zone in there. The ONE organizational thing I do that works is a peg board for wire spools that sits on the work desk. My husband made it for me, and its awesome. I try to keep all the copper together, brass, silver, colored craft wire all have their own pegs. The tin storage thing would work great for jump rings! How delightful & tidy your work area is! I need to work on mine =)as I haven't reorganized after the effects of its hurried move from living room to basement & the chaos of doing a show. I use clear plastic boxes that can be mixed & matched to sort my beads by color & material while my stringing supplies are mostly loose. I do use a dowel rod to keep my silk cord tidy; I do a lark's head knot to attach it to the wooden rod & smile to see my rainbow of pretties. I love the idea of putting as much as possible on the pegboard/walls. Have been using sectioned trays for years, even though it's organized, it feels like it stifles my inspiration. Erin's materials wall makes me want to make something! Thanks so much for sharing, Erin! I love, love, love the pegboard! I'm looking forward to organizing (creating) my studio space when I retire from teaching in June. I get mine from Michael's or ac moore on sale or with a coupon. Thanks for sharing your resource list. I love the peg board idea. I think I might need to visit that container store for the clear drawers that you have pictured. Last year I finally bought 3 clear fishing tackle boxes with space inside that is adjustable. I have my entire Etsy store in those 3. I also sorted all of my beads by color.The metals are also sorted by type. I bought 3 bead storage boxes at Michael's with 4 drawers each and with handles for caring. I use those to move my beads from Delaware to Florida because I am a snowbird. I don't have all of my beads in them but a good selection to work from. Under the lid there is storage also. I keep my ribbons in one, my wires in another, and misc in the third. They all fit into a closet for storage. My real problem area is my desk. It is large and I tend to pile beads that I love and plan on using along with what I am working on. I need to not keep piling all of those gorgeous beads on it! I end up not being able to see what I am looking for even when I am looking straight at it. I love your peg board wall. This summer we are turning our back deck into an enclosed studio for me. I am definitely going to have a pegboard wall. Right now most of my beads are in plastic tackle type boxes which I don't like and I have been trying to figure out how I want them all once I can have them out. A few years ago, I turned a spare bedroom into my studio so I am lucky enough to have a whole room to make a mess in! I have 3 large tables for my beads, metal work , and enameling. The best thing I did was put up the white metal shelves they sell at Home Depot for closet organizing. They don't get dusty and they keep my supplies off the tables. Well, that's the plan! Somehow my studio is still s mess most of the time. I love your pegboard. Oh Erin, I can so relate to those rare moments in the studio with a toddler! Love how you organized, and I know how good that feels. When I had to redo my entire studio earlier this year due to water damage, I took a serious look at my organization methods. Sometimes, starting over is a blessing in disguise. The biggest assest to me, is the antique printers cabinet I found for my beads. I love having everything all in one place and each drawer is designated for a certain type of bead. I really like your wooden display trees too. I am inspired by your pegboard, Erin. I'm trying to picture where in my studio I might hang one, too. IKEA is my favorite resource for storage items. Thanks so much for sharing! I would so love to be organized...but it seems sometimes the more I try the less I am. Do love the peg board idea! Might get some of the "stuff" off my work space! I use the divided plastic boxes to organize my findings and I label the boxes by metal type - SS, gold-filled, etc. They are easy to find and I can travel with them if needed. I also keep a 12" wood scrapbook box with a bead mat cut to fit. This makes a good traveling jewelry station for in front of the TV or on the road. A 12" ruler fits inside for measuring. My dream is the pegboard for organizing my wires and tools. Love your space! I use a combination of containers for organizing my supplies. Everything from hubby's tackle boxes, takeout containers, baby food and canning jars! Hubby is building me a new bench, so I'm going ask for some peg board to hang above it! Pretty please count me in for this amazing giveaway! Thanks! I am so envious of your peg board. I have wanted one for the longest time but my only wall that I could use came complete with the symbol from Firefly painted on it. If I covered that up I would just break my husband's heart. I agree with everyone that your pegboard idea is a great one. I separate everything by color although I have my seed beads and pearls in containers by themselves. I use Craft Mate containers with 14 compartments. I use one or more per color with the colors and sizes separated. Thank you for the opportunity to win the storage containers. Those aren't the only bead crafting jewels around. You've also got some starter bead making tools at a discount even. Don't buy somebody elses jewelry, craft your own. Hmmmm, looks like no one yet Carol.